The Bogad swamp "horse" is a reptilian-like creature from the planet Bogad, at the corner of the universe. It lives in a swamp, laden with traps and pitfalls, near the home of the Professor's friend Adoy. When Fry, Bender and Leela visited Bogad to find Adoy, [console game] they met up with Zoidberg. 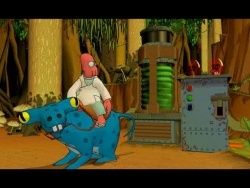 Zoidberg found the animal and took a liking to it, as he was able to ride it as a horse. The crew sent Zoidberg on a mission to activate Adoy's time tunneller, by riding the "horse" through the swamp. However, once they completed the mission, the two were left behind. This page was last edited on 22 October 2013, at 02:26.